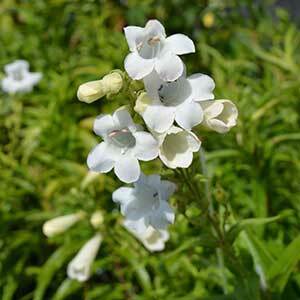 A white flowering evergreen perennial, Penstemon ‘Swan Lake’ gets its name from the pure white flowers. Variously described as a sprawling or spreading plant, it grows well in a humus rich well drained soil. The flowers appear on tall stems to around 60 cm in height. Foliage is a deep green, lance shaped with some serration. Admired for its long flowering period, ‘Swan Lake’ is a penstemon that will flower first in spring and then through to late summer. With a little dead heading, the length and intensity of flowering makes a perfect plant for the cottage garden border. Use ‘Swan Lake’ to underplant roses and other tall growing shrubs. Grow it in the garden border as a filler, and use it for cut flowers as well. Plant it in front of evergreen hedging plants as a contrast plant. Grow this attractive perennial in a humus rich well drained soil. Add some compost and well rooted cow manure before planting. Prune back to ground level in late winter before new growth commences. Propagation is easy by division of established clumps. Best divided in early spring.